While I was experimenting with the Pilot Falcon nib (long before I got distracted by the L.A. Pen Show last week), I was still a little unsure whether I wanted a Sailor music nib like the one I had used (by borrowing from a member of the Pen Club) and was truly enamored with or to be swayed by reviews, which were leaning heavily away from the Sailor and toward the Platinum music nib. Ideally I wanted to borrow the latter to try, but no one I knew had one. Eventually influenced by reviews as well as my own curiosity, I decided to buy a Platinum 3776 Century. You’ve probably noticed that my pen reviews are unlike most you see on fountain pen blogs – I don’t photograph or describe the box the pen came in, the clip, the filling mechanism, the body color and finish, etc. (You can find those kinds of photos and reviews easily enough elsewhere.) All I really care about is nib performance while sketching, and a little about the body weight or shape if they affect sketching. I’m not even very interested in what the nib looks like (other than the shape, which obviously influences performance). However, I will say that the Platinum’s music nib is quite lovely – it’s probably the most attractive of all the nibs I own so far. Of the pen bodies with variable-width nibs that I’ve been trying during this Epic Search, the Platinum 3776 is a bit larger and heavier and feels more substantial than the others (and therefore costs a bit more). I knew that I tend to prefer pens with a larger girth when sketching, but I thought I also preferred lighter-weight pens (such as my old Sailor fude pen, which is a very lightweight plastic). It surprised me to learn that the Platinum’s weight as well as girth made it seem more stable and solid while sketching, and now I prefer that size and weight. 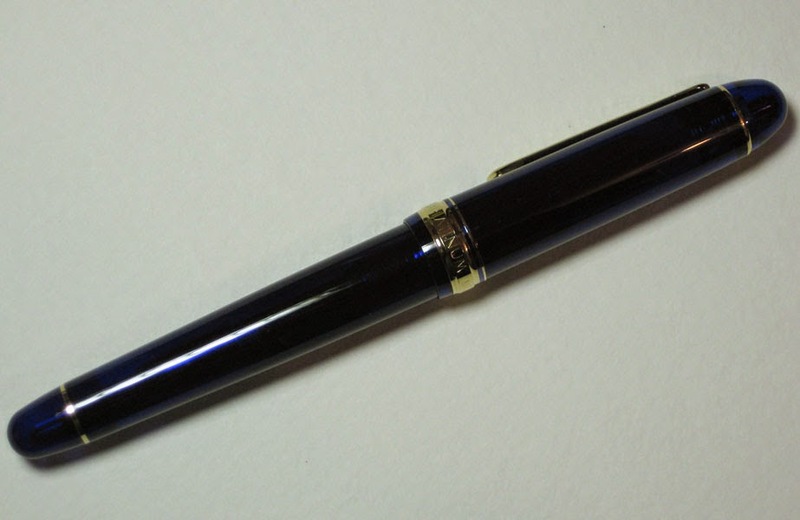 In the latter part of my search, I started seeking out pen body types more similar to the Platinum 3776 rather than the smaller, lighter-weight Sailor 1911 Profit Standard. Unfortunately, most of the specialty nibs are available on a limited number of body types, so in many cases, I didn’t have much choice. Writing samples made with Platinum music nib. Back to the nib. According to Gourmet Pens, the proper way to hold a music nib is at an extreme sharp angle – almost perpendicular – to the paper, and turned, producing a thick horizontal line and thin vertical line. 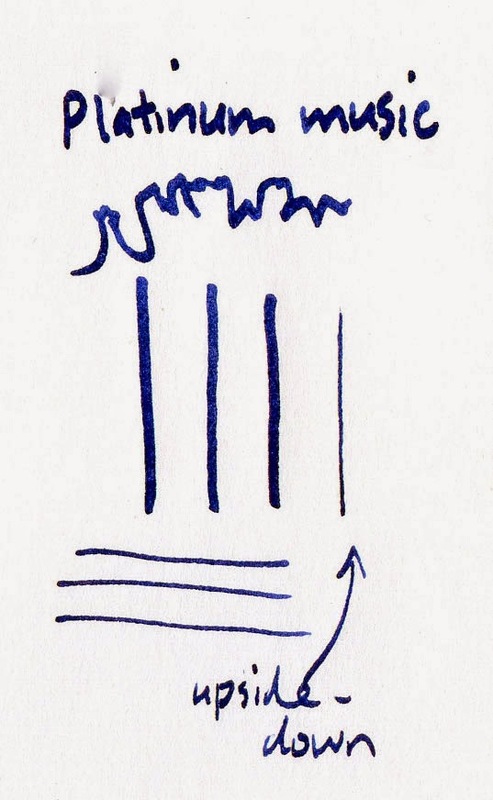 I found that angle too awkward to sketch with, so I hold it at a normal sketching and writing angle for myself, and the nib produces the opposite results – a thick line in the vertical direction, and a thin line in the horizontal direction. Since the only music nib I had ever tried (the Sailor) has a broad stroke but not overly so, I was surprised by just how wide the Platinum music nib’s widest stroke is – much broader than the Sailor’s. The first time I sketched with the Platinum, it felt almost like a chisel-cut marker – and felt that clumsy. (In fact, it felt similar to experiments with calligraphy nibs but less harsh-edged.) 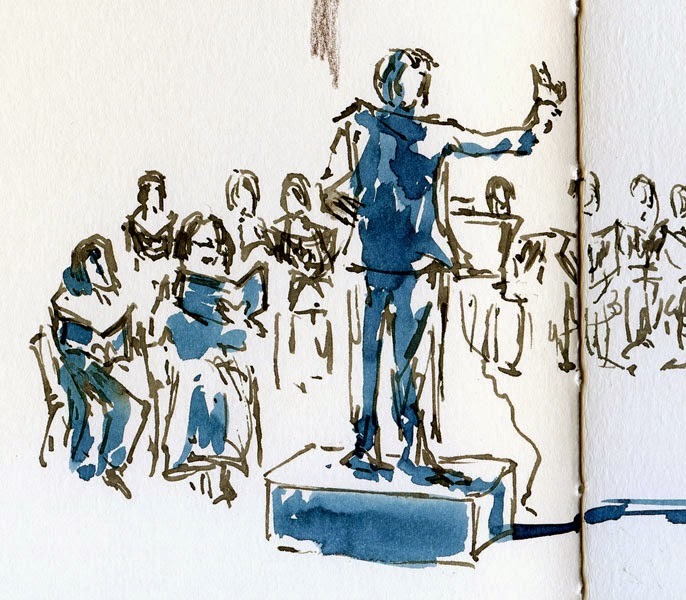 But I warmed up to it quickly, mainly because of the subject matter of that first sketch: a conductor, choir and orchestra performing at a holiday concert (see detail below). 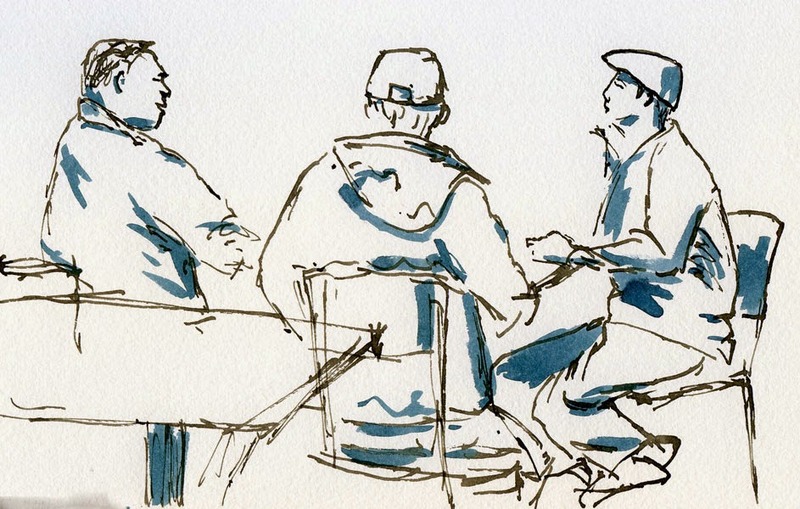 Since I couldn’t see much detail from a distance in a darkened church, the music nib gave me a nice, loose line ideal for sketching those kinds of figures. 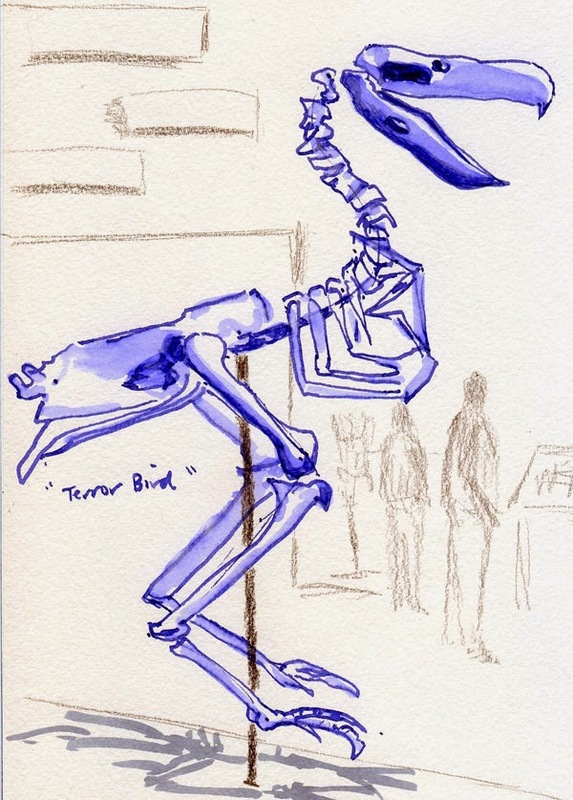 Another example of a situation in which the Platinum music nib excelled was during a yoga class, where I was invited to sketch (see detail below). I first tried using my familiar Sailor fude pen but soon found that its finer nib frustrated me by encouraging me to draw small and tight. 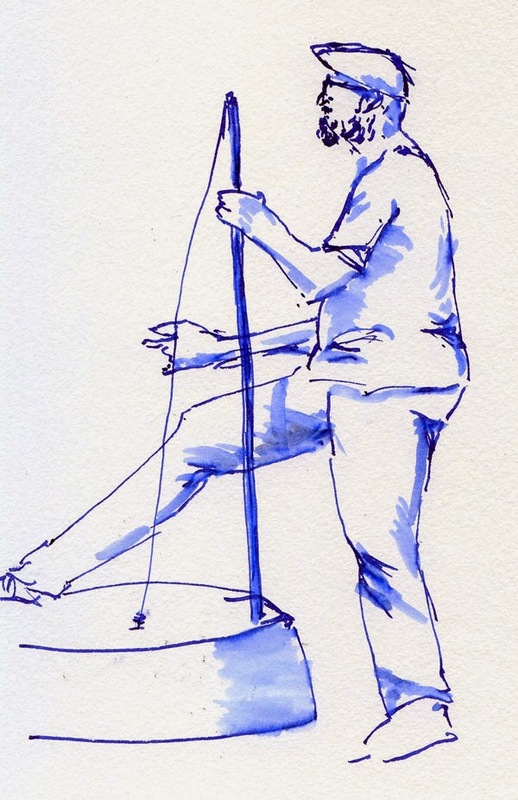 Capturing the fluid motion of yoga required a looser, broader nib. 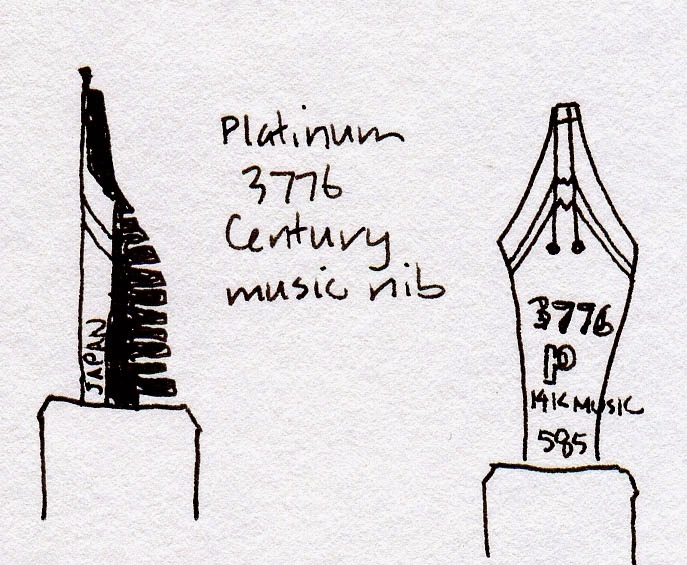 What’s more, the Platinum music nib (and the 3776 Century pen’s design in general) is beautifully reliable. It starts immediately every time, thanks to the pen body’s “Slip & Seal” mechanism that keeps it from drying out (apparently for up to 24 months, according to GouletPens.com’s marketing information). If that marketing copy is true, that’s one heckuva long idle time! I’m probably not going to test it for 24 months, but I’ve inadvertently left it idle for two full weeks, and it started up immediately. Would I sketch with it regularly? No – mainly because, despite the line widths I can get with it, the range is still narrower than my old trusty Sailor fude. Although turning the Platinum music nib upside-down yields a relatively fine line, it can’t match the very fine line I can get with the Sailor fude turned upside-down (similar to an extra-fine conventional nib). Still, the Platinum music’s broad stroke has grown on me, as well as its reliability, and I’m happy to have the pen for times when my sketches would benefit from a looser line (more often than I probably admit to). So although I was happy with the Platinum music, that Sailor music nib I was so smitten with was still on my mind. . . (stay tuned next week). You wouldn't know it from my photos, but the pen is a dark "Chartres Blue,"
Glad you are happy with the new nib. Like anything new we find that certain things are just easier to use in certain situations. Happy sketching! I dug around in my desk drawer and found my Platinum. It's too broad for me to write with happily, but it's a really good drawing pen, especially with a wet ink.